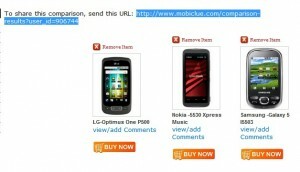 From the last few months we were working on a online mobile comparison and price search tool for Mobiclue.com. Today we are introducing the pre-final version of the application for public testing. You might have already noted the changes in home page and the sub pages of the blog. We analyzed a few other leading Mobile websites and their offerings to formulate a quick idea of what people are looking for. This application has three main modules; a specifications page, simple price search tool, and an advanced mobile comparison page. This section hosts the detailed specifications and photos of mobile handsets released after 2009. There is also an option to comment and rate each mobile phone within the specific pages. We are continually developing our phone database. 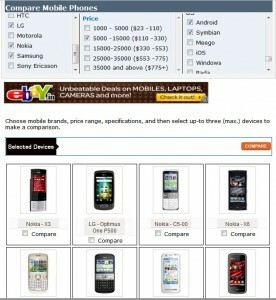 For now we have Nokia, Motorola, LG, Samsung, HP, Sony Ericsson, HTC, Acer, Dell and BlackBerry phones in this list. An Example specs page : Apple iPhone 4. and photos. This tool will help you search and sort mobile phones in your desired price range. You can find it at the top right corner of the site. You can either choose one brand or leave as blank to list all brands in the specified range. Example result: Mobile phones in 10000 INR- 15000 INR rage here. The advanced mobile comparison tool can be accessed here. It is an ajaxified application that could provide you with real-time results based on selection of phone specifications. We have given brand, price range, Camera, storage, display size, display type, connectivity and OS options for selection. Please note that it would take some time to load if you are using a slow internet connection. You don’t need to refresh the page after selecting each option. The results will automatically appear just below the selection tool as shown in above image. After this you can select up-to three mobile phones and hit the orange button to make a comparison. Comparison results will be appeared in a new page. You may share the comparison results with your friends by using the URL given within the comparison results page. Example comparison: LG Optimus One vs Nokia 5530 vs Samsung Galaxy 5 here. We invite our readers to test these tools and share your views in the comment section. Thanks! very good site…….we gain a lot of knowledge about mobiles….